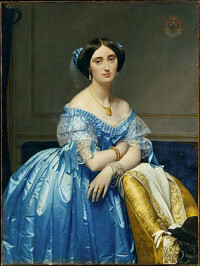 Jean-Auguste-Dominique Ingres was born in Montauban, France in 1870. As a young child, he was both musically and artistically talented and enrolled at age 12 at the Academy of Toulouse. In 1797, he left for Paris to study with Neoclassical painter Jacques-Louis David. Unlike his master’s modern classicism, Ingre’s work was characterized by more of an antique notion with severe linearity. 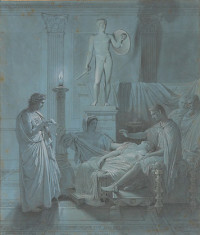 He was admitted into the École des Beaux-Arts and won the Prix de Rome in 1801. At the Salon of 1806, his panting “Napoleon I on His Imperial Throne” scandalized the judges with its harsh geometry, symmetry, Gothic artificiality, and flatness. As his career progressed his works were frequently criticized in the Salons. In 1819, he moved from Rome to Florence, and his work took a more religious and classicizing style, which gained more favor among critics. In 1825, he opened a teaching studio in Paris, which soon became one of the largest and most important of its time. In December 1833, he was named president of the École des Beaux-Arts. 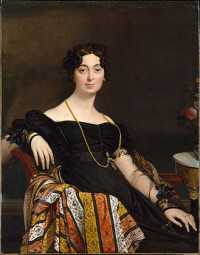 Unhappy with the criticism of liberal critics, he returned to Rome, becoming the director of the Académie de France there in 1834; he returned to Paris in 1841, gaining favorability among conservatives and the upper class as a sought after portraitist. 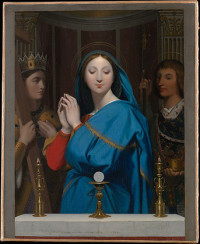 His death in January 1867 signaled the end of conservative monumental history painting in France.